Here at GeekSays we’re giving away an iPad mini retina to one lucky winner. The iPad mini retina has quickly become one of Apples biggest sellers (just behind the iPhones off course) and that’s no surprise because any way you look at it, the iPad mini is just amazing! Now’s your chance to win a brand new iPad mini retina well ahead of the launch of the iPhone 6 and new iPads this coming fall. Before we get into the details on how to enter we just want to cover some rules: this giveaway is for a brand new 16GB iPad mini of the color of your choice and only one entry is allowed per user. 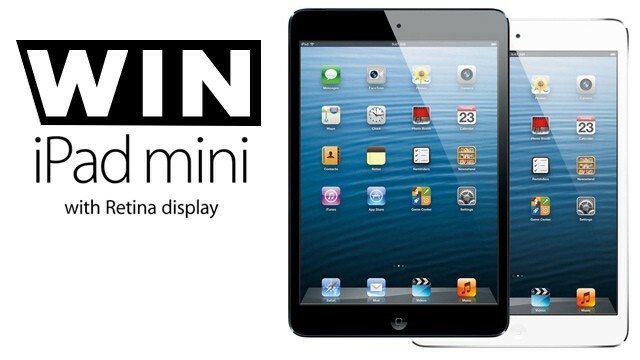 Anyone, of any age, living on planet Earth can enter to win the iPad mini retina. There is absolutely no restriction. If you know how to use a mouse, a trackpad, or a Multi-Touch screen, then consider yourself eligible for this iPad mini giveaway. Don’t forget to post your twitter and name here in the comments! My name is Randall Davidson (@theagent76) and you should pick me because my wife never lets me use her ipad and it doesn’t even have a retina display! I would really like to win this Giveaway and get an iPad retina because I never had one. I would love to get my hands on iPad mini retina to try it. Hope you would count me in. I am doing all of the above – my twitter is @fairyfractal – and I should win because I am a geeky mom of two toddler girls, and having an ipad mini wth retina display would make my existence so much more fun and exciting. Thank you for the amazing giveaway. Hello, My name is Abhishek Gupta and my Facebook id is abhishek.gupta15 and Twitter id is Absk_Gupta. My Facebook name is “Abhishek Gupta”. You should pick me because I love gadgets but never had any Apple device in my life. I know it may sound weird but I am an middle class Indian and can’t afford it. And it would also help me in my studies, in getting my B.tech degree, my part time content writing and remaining connected to my family 2000 kms away from me.